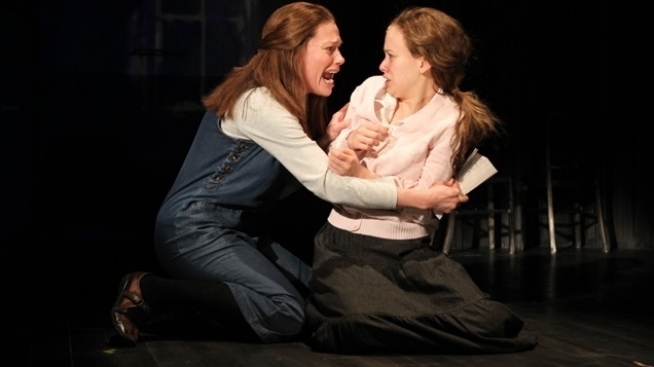 Really, I'm only thinking of what's best for you: Marin Mazzie and Molly Ranson in the recent revival of "Carrie"
Can you handle another date with “Carrie”? The troubled high school student, last seen on the New York stage this spring in an Off-Broadway revival, will be available for social calls starting Sept. 25. That’s when Ghostlight Records releases the first-ever cast recording of the musical, with vocals by Marin Mazzie (“Kiss Me Kate”), Molly Ranson (“Jerusalem”) and the company of MCC Theater's take on the 1988 musical. The soundtrack, with music by Michael Gore and lyrics by Dean Pitchford (“Fame”), will be available on iTunes, Amazon.com and through pre-order at Sh-K-Boom’s Web site. A teaser trailer of the album can be viewed here. “Carrie: The Musical” is, of course, based on Stephen King’s best-selling novel, about a teenager whose life is made unbearable by an oppressive mother. The book was adapted by Brian DePalma for the 1976 film starring Sissy Spacek. The 1988 Broadway musical, starring Betty Buckley, remains one of the greatest flops ever, running just five official performances and losing on the order of $7-$8 million. This year’s Off-Broadway revival eamed middling reviews, but wasn't anywhere near "disaster" territory, running for more than two months. When the revival closed at the Lucille Lortel Theatre on April 8, the MCC’s artistic directors said: “MCC, the authors, and the director achieved what we all set out to do – to rescue 'Carrie' from oblivion and to give her new life."